Home News 11 European Sites shortlisted for ‘The 7 Most Endangered’ programme. 11 European Sites shortlisted for ‘The 7 Most Endangered’ programme. The leading European heritage organisation Europa Nostra and the European Investment Bank Institute announce the 11 monuments and sites shortlisted for ‘The 7 Most Endangered’ programme 2014. Among the threatened landmarks selected by an international panel of experts are a Roman archaeological site in the Former Yugoslav Republic of Macedonia, a medieval monastery in Armenia, two historic neighbourhoods in Kastoria in Greece, an 18th century citadel in Italy, a 19th century stage machinery in Belgium, and a 20th century housing complex in Russia. Some are in danger due to lack of resources or expertise, others due to neglect or inadequate planning. The announcement of this year’s shortlist coincides with the opening day of the conference ‘Heritage First: towards a common approach for a sustainable Europe’, hosted in Athens by the Greek Presidency of the European Union. The final list of 7 sites will be made public on 5 May during the European Heritage Congress in Vienna. “These monuments and sites were selected taking into account not only their remarkable heritage and cultural values but also the serious danger that they are facing. The engagement of the local communities and the commitment of various public or private bodies to saving them were also considered vital. Another important criterion was the potential of these sites to stimulate socio-economic development,” stated Piet Jaspaert, Chairman of ‘The 7 Most Endangered’ advisory panel. “Europa Nostra welcomes the increasing recognition by EU Institutions, including the European Investment Bank (EIB), that cultural heritage is both a strategic resource and a driving force for a sustainable Europe. We therefore very much count on the commitment of those Institutions to assist local, regional and national authorities throughout Europe in their efforts to save and enhance our heritage,” stressed Denis de Kergorlay, Executive President of Europa Nostra. “In 2013, in its pilot year, ‘The 7 Most Endangered’ programme successfully raised awareness about the most threatened monuments and sites in Europe and mobilised multiple stakeholders in several countries, from Portugal to Turkey. The potential of this programme is enormous but it can only be fully exploited with widespread support, not solely from EU Institutions but also from public and private partners. Rescuing our endangered heritage is a mission that we have to undertake all together,” he added. “The successful restoration and promotion of cultural heritage can have significant social and economic benefits at the local, regional and even national levels, in terms of increasing tourism, creating jobs and improving investment opportunities. To this end, the European Investment Bank Institute is backing ‘The 7 Most Endangered’ programme. Experts from the Bank will provide analysis and advice and will help formulate a feasible action plan for each of the seven sites,” explained Rémy Jacob, Dean of the EIB Institute. This year, civil society organisations and public bodies from all over Europe submitted their nominations. Eleven sites were shortlisted by an international panel of specialists in History, Archaeology, Architecture, Conservation and Finance. The final list of 7 sites will be selected by the Board of Europa Nostra. ‘The 7 Most Endangered’ for 2014 will be unveiled at a press conference on 5 May at the House of Europe in Vienna by high-level representatives from Europa Nostra and the EIB Institute. ‘The 7 Most Endangered’ programme was launched in January 2013 by Europa Nostra with the European Investment Bank Institute as founding partner and the Council of Europe Development Bank as associated partner. It was inspired by a successful similar project run by the US National Trust for Historic Preservation. ‘The 7 Most Endangered’ is not a funding programme. Its aim is to serve as a catalyst for action and to promote “the power of example”. 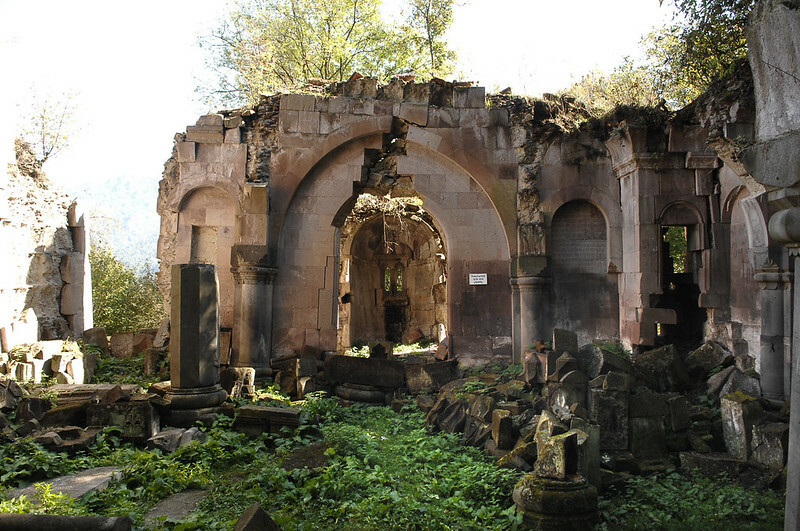 This monastic complex, dedicated to St. Gregory the first official head of the Armenian Church, dates from the 10th to the 13th centuries. Situated in the cultural landscape of the village of Dsegh, deep in a verdant gorge, the stone structures of the main buildings lie in ruins, without roofs, and encroached on by vegetation. The rehabilitation of the monument would help establish Dsegh as a centre for tourism and boost the local economy. However, it can only be accomplished with international expertise and support. The Ministry of Culture of the Republic of Armenia nominated the monument for ‘The 7 Most Endangered’ 2014. The Bourla is the last remaining municipal theatre in Europe with original stage machinery, created by the French company Philastre and Cambon in 1834. The stage machinery as well as the Neo-Classical building by the Belgian architect Pierre Bourla were, in fact, completely restored in 1993 in the context of Antwerp European Capital of Culture and even received a Europa Nostra Award. If the historic and still workable machinery in the fly tower and understage is dismantled and replaced by modern equipment – as proposed by the resident company – one of the only theatres in Europe where 19th century operas and dramas can be staged authentically will be irreparably lost. The nomination for ‘The 7 Most Endangered’ 2014 was made by PERSPECTIV – Association of Historic Theatres in Europe. Dating from the 5th to the 3rd centuries BC, this is the largest and most prominent monument of the ancient Thracian culture in the region of Malko Tarnovo. Located in the heart of Bulgaria’s biggest natural park, the sanctuary can only be reached by a forest path. It is constructed of well-carved marble blocks joined by metal brackets and the most impressive element is the 25-meter peripheral ring. The sacred place is threatened by the weather conditions and the surrounding flora. National and European technical and financial assistance are required to preserve the site and transform it into an educational and tourist attraction. The Historical Museum Alexander Fol in Malko Tarnovo nominated the site for ‘The 7 Most Endangered’ 2014. The quarters of Dolcho and Apozari, with their medieval churches and 18th-19th century mansions, make the lakeside mountain city of Kastoria one of the most distinguished in Southeast Europe. Since World War II, the city has suffered considerable damage as a result of population growth and the construction of apartment blocks. The economic crisis and high unemployment rates have aggravated the situation. Local authorities, NGOs and private partners have joined efforts to restore the historic buildings but increased national and European support is needed. Its rehabilitation would be a vital tool to overcome the crisis at the local level. The nomination for ‘The 7 Most Endangered’ 2014 was submitted by Elliniki Etairia – Society for the Environment and Cultural Heritage in cooperation with the Municipality of Kastoria. This is the most important hexagonal fortress in Europe, according to UNESCO, on whose Tentative List it has been inscribed since 2006. Spreading over 74 hectares, the Citadel of Alessandria is a perfect example of a modern-type fortress. Built between 1732 and 1808, it was the setting of several key moments in the history of both Italy and Europe. The most imminent threat to the monument is the proliferation of a very invasive weed, the roots of which are seriously undermining the walls. The local community and authorities are strongly engaged in making the Citadel viable but they need widespread (inter)national know-how and financial help. FAI – Fondo Ambiente Italiano nominated the site for ‘The 7 Most Endangered’ 2014. Golemo Gradište is the site of a late Antique city in the Roman province of Dardania, dating from the late 5th and early 6th centuries. Covering a 17-hectare area, its urban planning, fortifications and churches represent the initial phases of the development of European urbanism and religious architecture. Excavations have revealed a number of rare structures. Emergency measures are required to protect the remains from the weather, looters and further decay in general. With European expertise and funding, the site and its wider surroundings could be developed as an archaeological park and thus stimulate cultural and rural tourism. The nomination for ‘The 7 Most Endangered’ 2014 was made by the Archaeological Museum of Macedonia. For three centuries, this site, located in the remote village of Vilar de Perdizes in North Portugal, provided material and spiritual comfort to pilgrims to Santiago de Compostela. Established in 1555 through a Papal bull, it included a hospital, a pharmacy and a chapel. These three buildings are today in an advanced state of decay, while the manor house, which integrates 16th century, Baroque and Mannerism elements, is seriously endangered due to the instability of its foundations. The renovation of the site to host a museum and an interpretation centre would help revitalise the Santiago route in the region and develop tourism activities. The Associação Portuguesa das Casas Antigas nominated the site for ‘The 7 Most Endangered’ 2014. The two towers of the Mafra National Palace feature a unique set of 120 cast bronze bells, divided into hour, liturgical and carillon bells. These outstanding musical instruments, both of which cover a range of 4 octaves, are the largest surviving 18th century carillons in the world. Due to lack of maintenance or poor conservation, the wooden structures that support the bells are at risk of collapse. The restoration of the two carillons would allow the fruition of the most singular expression of the musical European Baroque and foster an international musical and cultural circuit. However, this can only be achieved with transnational technical and financial help. The nomination for ‘The 7 Most Endangered’ 2014 was submitted by Centro Nacional de Cultura. Small communities built these vernacular structures, using wood from Romania’s thick forests and traditional construction techniques, in the 18th-19th centuries. The modest architecture of these churches is enhanced by their privileged location and their artistic mural paintings. Despite their historic, social and cultural importance, numerous churches have been abandoned over the past few decades, due to their small capacity and lack of amenities, and are today in an advanced state of disrepair. The local community has made major efforts to rehabilitate and reuse these religious buildings but they have to be backed at national and European levels. The Pro Patrimonio Foundation nominated the wooden churches for ‘The 7 Most Endangered’ 2014. Built in 1924, the Colour Row Settlement is the only remaining example of the early work of the renowned German architect Hans Scharoun in former East Prussia. It is a prototype of modern domestic architecture and an immediate forerunner of other pioneering social housing projects in Germany, such as the Siemensstadt in Berlin (classified by UNESCO in 2008), in which Scharoun was also involved. Restoring the Colour Row is a technical and financial challenge which has to be tackled with (inter)national cooperation. Its renovation and the creation of a research centre could boost tourism and the local economy. The nomination for ‘The 7 Most Endangered’ 2014 was made the International Centre of the Roerichs. This is one of the finest examples of Art Nouveau religious architecture in Central Europe. Designed by Hungarian architects Marcell Komor and Dezsö Jakab and built in 1902, the Synagogue of Subotic combines a modern concrete and steel structure with traditional decorative elements from Hungarian Folk Art. Once the spiritual home of the large Jewish community in the region, the synagogue has been neglected since World War II. Despite the restoration works undertaken in recent decades, the building remains highly endangered. International expertise and solidarity are needed to save this architectural and cultural gem. Europa Nostra Serbia nominated the monument for ‘The 7 Most Endangered’ 2014.